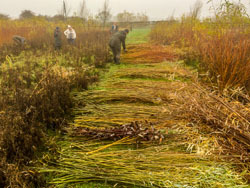 In November 2018 a coppicing session was held at Beckingham Old Willow Works willow plantation by members from The East Midlands Group of Flowers from the Farm. This is a not for profit, multi award winning, cooperative of British cut flower growers founded in 2011. They, together with a few members of Beckingham History Group, all armed with loppers and secateurs spent a very wet, cold and misty morning coppicing a large area of the plantation. 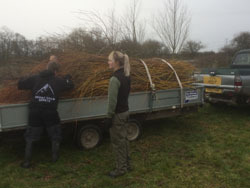 The willow was to be used by Flowers from the Farm at a training session to make Christmas wreaths and hearts held at the Willow Works in December 2018, which was available for booking by anyone interested. 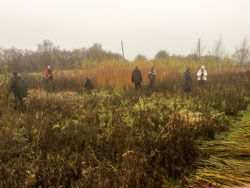 In January 2019 another coppicing event took place well attended by members of the RSPB, Willow Works Community Group, Flowers from the Farm Group and Beckingham History Group. The wet and cold weather did not seem to deter anyone, the job being carried out with enthusiasm. Refreshment of home-made soup and bread, plum loaf and cheese, along with tea and coffee was provided by the History Group and much appreciated by all. Several different types of willow with attractive coloured stems are grown in the plantation and it has many uses including creating environmentally friendly floral tributes for funerals, and hearts and stars for summer weddings. Those attending were invited to take some for their own use if they wished. On both occasions much of the surplus was later collected by Yorkshire Wildlife Park to be fed to their giraffes and rhinoceroses. We apologise for the poor quality photographs mainly due to the poor weather. If anyone has any better ones of either event they would like added please let us know. Thank you.